This Giant Irish Deer is believed to have roamed the lowlands of central and eastern Ireland. Adult pre-rut stags weighed over 1 tonne, whereas the hinds weighed about a half a tonne. The stags and hinds display similar levels of sexual dimorphism (differences between adult males and females in terms of overall body size) as their direct living relative, the fallow deer. 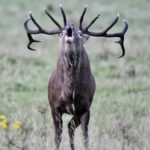 Both stags and hinds stood at 1.8 metres at the shoulder and the stags only bore antlers with a width of up to 4 metres, (combined weight up to 45kg) are the largest antlers know to have existed on any old world deer species. They were palm like antlers, similar to those of a Fallow deer, it’s nearest living direct descendant. 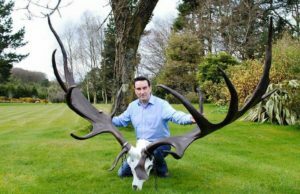 The giant ‘Irish’ deer was present in Ireland before and after the last great Ice Age. 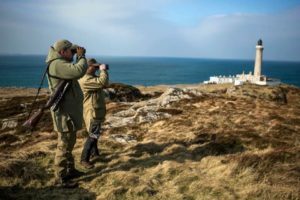 However, as the climate warmed after the retreat of the last big glaciers of the last Ice Age, the vegetation in Ireland consisted of phases of grasses and sorels, juniper and least willow about 13,000 to 12,500 years before present. This vegetation dominated the grasslands, heath and open country of Ireland, as evidenced from the pollen records. This was prime grazing food for the giant deer. But there was a rapid cooling which occurred at about 12,000-11,000 years before present, which lead to a readvancement of the glaciers certain areas of Ireland. The change to arctic like climatic conditions led to a significant and rapid change in the vegetation, resulting in open tundra-like conditions. 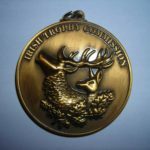 The giant deer could not adapt at the same pace of the changing vegetation and could not migrate from Ireland elsewhere as Ireland was an island. Thus, localised extinction occurred in Ireland, with the majority of the giant deer fossil bones dating to 12,150 to 10,600 +/-495 years before present. After a gestation or pregnancy length of approx. 36 weeks, adult hinds would have separated from the main female herd, to give birth, perhaps, in the small copses of forests that were found in Ireland and this habitat would have provided protection and security for both mother and offspring. The calf would have weighted approximately 29kg (a bit smaller than an adult female sika deer!). 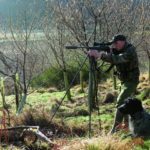 Wolves, which were present in Ireland during this time, would have posed a threat to the young calf and solitary female, akin to present day adult solitary female moose and their calves. Timing and location of calving sites would have been very important against such predation. There is no direct evidence that giant deer gave birth to twin calves, although it is not impossible. For example, of comparable size, female moose in excellent physical condition will give birth to twins, each weighting approximately 15kg. 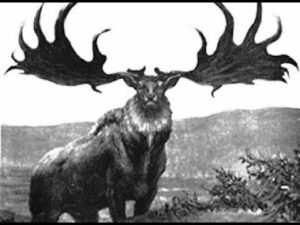 Even though they are known as the (misnamed) Irish Elk (they are not a elk), fossils have been found in such countries as France, Germany, Austria, Hungary, Britain, Scandinavia, Italy and Central Asia. 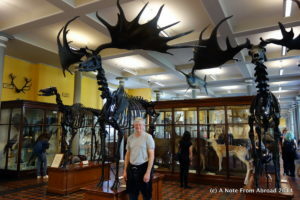 However, the best collection of fossil’ can be found at the National Museum of Ireland where there are 10 complete deer skeletons and over 400+ partial remains, which includes 6 females. There have been many fossil finds throughout Ireland, with the most famous been Ballybetagh Bog, Glencullen, Co. Dublin where over 100 deer skeletons were found. Other sites are Howth, Co. Dublin and Lough Gur, Co. Limerick. These fossils have been mainly found in peat bogs and in old lakes, with some older fossils even being found in caves. The giant elk would dwarf modern man, By BBC News Online’s Dr Damian Carrington: The giant Irish Elk survived the last ice age – but probably only just. 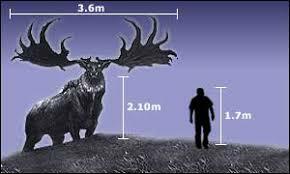 The enormous deer, which sported antlers 3.6m wide (10 feet), was thought to have perished along with woolly mammoths in the frozen wastes. But new fossil dating evidence shows that..
Megaloceras: 1/20 scale, one piece cast with the exception of the antlers. Included is a simulated terrain base with clearly marked footprints for easy positioning as well as a contoured pine base for display. Hughes S, Hayden TJ, Douady CJ, Tougard C, Germonpré M, Stuart A, Lbova L, Carden RF, Hänni C, Say L (2006). Molecular phylogeny of the extinct giant deer, Megaloceros giganteus. Molecular Phylogenetics and Evolution 40: 285-291. Carden RF (2006). Putting flesh on bones: the life and death of the giant Irish deer (Megaloceros giganteus, Blumenbach 1803). Unpublished PhD thesis, NUI Dublin (UCD).